As promised, my February game is finished. It’s called Exploit, and it’s a game about computer security, terrorism, and totalitarian governments. Finished the story and the challenge levels, and I have to say, it’s pretty great all the way through. There’s a bit of an interesting difficulty curve – the LChan BB level in the first chapter is fairly complicated in terms of timing, while the rest of the chapter is rather easy. The second and third chapters are all very fun; I liked the fire dispatch level the best in the third chapter. It seemed to be one of the only levels where you had multiple iterations/angles of the same fundamental system, though the two bonus levels where you only had one and two ports and had to use timing also incorporated it. I would’ve liked to see more of that – and I’m curious if any of the player made maps will be of that quality; and if they are, if it will reach the public. A mappack, perhaps? The narrative was very fun, and reminded me a lot of uplink and slavehack. Could be taken seriously, not so completely over the top, humorous at the same time. Maybe I /should/ listen to sk3tch? … Then again, considering /last/ time, the whole mix would probably somehow become thermite. A word of warning: I’ve never actually tried the recipe. But Sk3tch swears by it. I was so entranced by this game that I finished it all in one sitting. I personally love your work and I’m currently checking out your various other titles. Hey, I just played through the whole campaign and through all of the bonus levels and I have to give this game a 9.5/10! The story was very well written and the mechanics are great too! The ONLY suggestions that I could make is to maybe change up the email messages a little so they don’t all start with “Hey whats up?” :) and the code used to play other people’s created levels is a little long and should be shortened. Besides those small things, I think you should work on a sequel! I would look forward for one. So Greg. This is what you’ve come to. In like 3, 4 months? The dialogue’s great, as I’d expect, and I the graphics are pleasantly minimalist. But the mechanics are really well done. As another person mentioned, I’d like to have seen more clever timing, but overall the game is smashing good. I think I know you’re philosophy to the way you build puzzles, so I rarely got hung up on any of them at all (Thanks Myst for teaching me metasolving). But the only reason I could do that was I knew you’d never create an arbitrarily hard puzzle. So if I had to click two different sequences, I knew that it would likely not be frustrating and that there’d be symmetry to make remembering it easier, or they would have a one to one relationship. It’s here that you really excelled. Great puzzle design, and I dearly hope you can keep this up! I thought I was going to really like this game. And I do. As I’ve said before. Hacking and the puzzle genre = a win in my book. Or should I say, my blog? Expect a post about Exploit sometime soon. 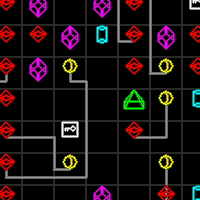 But before I go, I wanted to share this crazy idea I have for sharing levels. I love that you provided us with the editor and the codes to share with others. Inspired by how Spore can share data through computer images, I thought Exploit could do the same. Just take a screen cap of your level. Paste it into your favorite image editing software. Save as a JPEG. Find the file, right click, and go to properties. Click on the summary tag at the top and then click the “simple” button if it’s automatically set to “advanced”. Then just paste the Exploit code into the blank area for comments and you’re done! I wonder if all of this is too much? Oh well, I love hacking even if it’s pretend. All of that would be great, and I considered some form of image steganography myself for level sharing. Unfortunately, Flash is very limited in its ability to load and save files. Basically, a browser-based Flash app can only load a file from a URL, and can only save a file by POSTing it to a URL. It can’t use the file system proper. Just played the entire Story mode in a single sitting — well worth losing an hour of sleep for! Little touches like the phone hack level be in the shape of a phone tickled me pink, and the mix of difficulties helped to curb frustration. Never did figure out Motor Pool, though! Will recommend highly to others. Hey i just play the entire story mode, and it was a really cool game. I’m now doing the Challenge mode…i having troubles with 8, 13 and 15. I thought they were impossible, but now i see other people could so, i will play more. Congrats! This a awesome game. This really is very good fun.